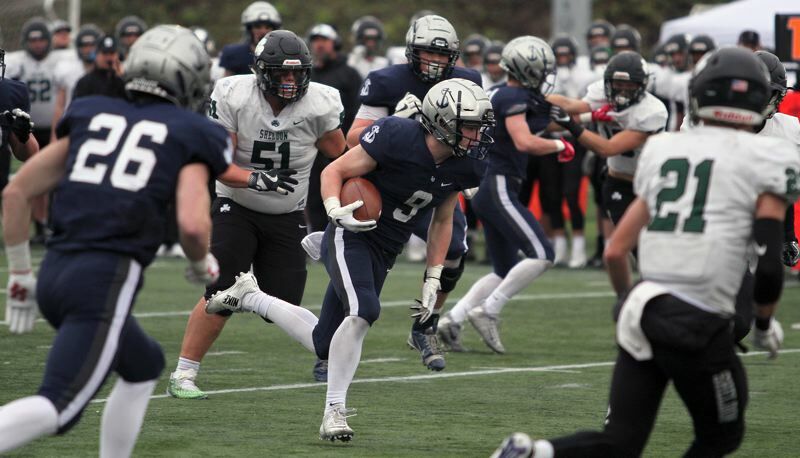 It's a fitting description for the Lake Oswego football team's offensive unit, but also for two of its most prominent members — junior running back Casey Filkins and senior quarterback Jackson Laurent. Filkins is a two-time, first-team all-Three Rivers League running back who was named TRL Offensive Player of the Year for 2018. Laurent was a first-year starter for the Lakers this fall who earned first-team all-Three Rivers League honors as a quarterback. Together — along with their talented line, two more big-time running backs and a devastatingly effective corps of receivers — that duo helped Lake Oswego win the second state football championship in school history on Saturday, beating Sheldon 34-27 at Hillsboro Stadium. Both played important roles in the win and both completed their 2018 seasons with an appreciation of what the other brought to the table. "We have the best running back here in the state," Laurent said of Filkins. "(He) can break it on any single play." "(Laurent) is an incredible worker and a great teammate," Filkins said. "He's just the best guy I know. He led this offense for sure." There are a couple ways to measure Filkins' and Laurent's success this year. The first is to look at their raw numbers. Filkins led the Lakers in rushing for 2018, finishing the year with 1,160 yards and 28 touchdowns on just 171 carries — good for a 6.8 yards per carry average. 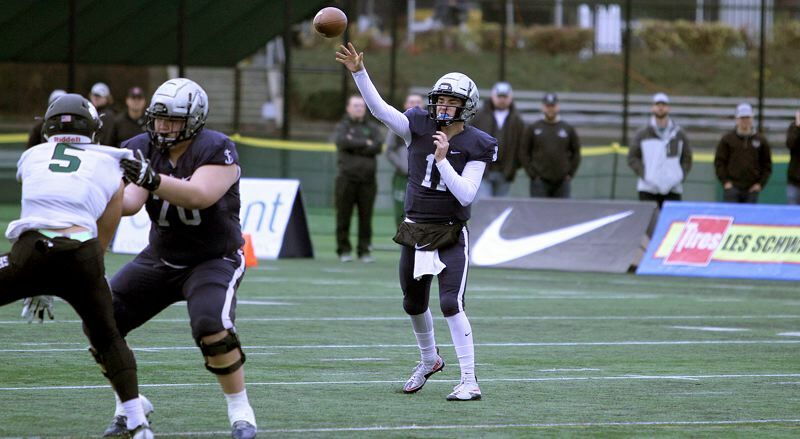 He was also Lake Oswego's second-leading receiver, catching 48 passes for another 869 yards and nine more TDs. Laurent was spectacular, too, in his inaugural season at the helm of the Laker offense. Over the course of the 2018 campaign, he completed 196 of 299 passes (a 66 percent completion rate) for 3,173 yards and 32 touchdowns while throwing just two interceptions. Another way — perhaps a better way — to quantify these two players' value, however, is to look at what they accomplished in the biggest game of the year, Saturday's title win over Sheldon. Against the Irish, Filkins carried 16 times for 90 yards and four touchdowns, and also caught five Laurent passes for another 77 yards and his team's other score. He ran for a 3-yard touchdown in the first quarter, scored from 3 yards again in the second period and added a 40-yard TD reception before the half that gave Lake Oswego a 20-10 advantage. Filkins scored again in the third quarter on a 13-yard sprint past the Sheldon defense, then sealed his team's win when he scored from 1 yard with 2:33 left in the contest to help his team re-take the lead at 32-27. And then, just for good measure, he caught a Laurent pass on the ensuing two-point conversion that provided the final 34-27 margin of victory. "It's a good feeling," Filkins said. "I just wanted to do what I could for our team. I was able to play pretty well and it paid off." While Laurent's final high school football game wasn't quite as flashy as Filkins', it was devastatingly effective just the same. He completed 14 of his 23 throws for 220 yards and one touchdown — the 40-yarder to Filkins in the second quarter — and no interceptions. But there was far more to Laurent's day than just that. Check out the list of big throws he made — his completions of 10 or more yards — and what they meant to the team. On LO's first drive, Laurent completed throws of 15, 11, 10 and 13 yards and the Lakers scored a touchdown. On LO's second drive, Laurent hit passes of 17, 10 and 38 yards and the Lakers scored a touchdown. On LO's third drive, Laurent completed passes of 10 and 40 yards, the second of those his strike to Filkins for the Lakers' third touchdown. On LO's fifth drive, Laurent ran for 21 yards (his only carry of the game), completed a 14-yard pass and the Lakers scored a touchdown. On LO's seventh drive, Laurent completed a 24-yard pass and after the Lakers scored a touchdown, hit Filkins for a two-point conversion on the final throw of his high school football career. "They got some pressure, but I was able to get away and look down field, either scramble or make throws," Laurent said, adding that he didn't really expect to end his senior season in the state championship game. "Not a chance. My focus was game after game, snap after snap. I never thought I'd end up here, but I'm so happy I did."